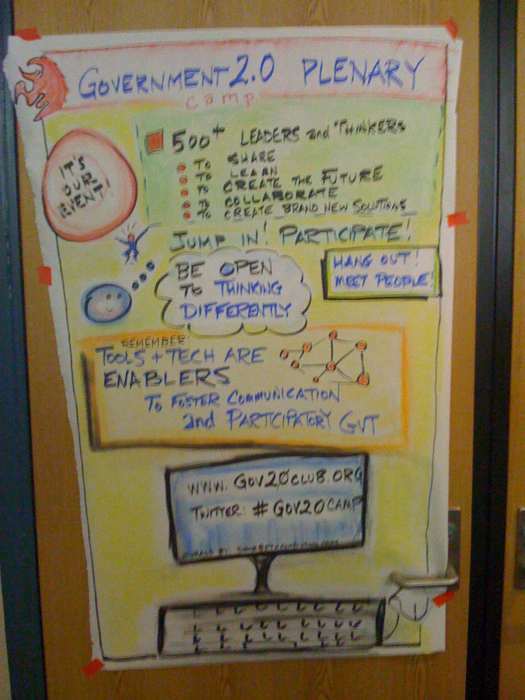 I’ll admit to being a bit skeptical about Gov20Camp when I heard that attendance was going to exceed 500 people. While I am familiar and comfortable with the concept of a bar camp unconference, I just hard a hard time imaging how you organize such a large group. I was one of the first sponsors of the event and did so with the expectation that 50-100 really smart people would get together and share ideas. I had a hard time imagining what would happen when amplified by a power of 10x. I’m happy to say I was wrong and this was a tremendous event. From the sessions I attended yesterday, I think the biggest challenge is not going to be “think different” but rather “think bigger”. In his closing remarks during the Us Now film panel Mark Drapeau noted that despite being the number 2 trending term on Twitter all day, none of this matters without scale and engagement outside this community of enthusiasts. This issue of engagement is the biggest challenge that the Gov20 community faces. In several of the sessions I also noticed a tendency to focus too narrowly and drill down into the weeds on issues that matter to us immediately versus the long-term implications of the issues. Gov20 privacy is not about how you set up your Twitter profile, it is how you create a construct that facilitates both privacy and participation across the spectrum of social media technologies. To that same extent, setting up your organization on Twitter does not a social media strategy make. While I realize that baby steps and technology adoption are important, we need to think bigger. Everyone at that conference probably agrees that Twitter is a tremendously enabling technology, but the real question is not how we use Twitter, but what does Twitter 2.0, 3.0 and 4.0 look like and how do we create strategies and change the dynamics of government to allow for the adoption of current and future enabling technologies? If you are struggling with Twitter 1.0 implementation now, just Twitter about it on #Gov20Camp and I am sure you will get dozens of volunteers willing to help you out. I was also incredibly happy to see such strong engagement by State and Local participants at the Camp. I truly believe that the State/local environment will be the proving ground for a lot of these technologies as they can more easily handle the issues of scale and scope. Social media volunteers should be looking to help these organizations engage and provide the proving ground for how Gov20 works. I noticed participants from as far away as King county Washington. Kudos to them for making the trip and being so thoroughly engaged. I also hope our technologists and web 2.0 gurus were paying attention to the technology requirements emerging from the many panels. I noted several opportunities for creating enabling technologies that are needed right now. For example, a vetted directory of legitimate government users on Twitter was a requirement I heard emerging over and over. If you want to follow King county, how do you know it is a trusted source and is the real King county? A trusted directory would be easy to implement and score a home run right now. A few smart techies pulling all-nighters and a handful of volunteers are all you need. I’ll buy the pizza and mountain dew! It will be interesting to see the splinter camps form that will also allow for deep diving on particular issues. For example, I’ve already signed up to participate in the camp that looks at how technology can be used in emergency situations. While I imagine that Gov20Camp will continue to be a successful event for years to come, these focused initiatives will also be essential. Overall, this was an incredibly rewarding event and I am proud to have participated and sponsored it. I regret I can’t make it to day two, but with three kids and a full Saturday agenda, I would need some family2.0 technologies to make that possible. Good luck on day 2, I’ll be watching the stream and checking out the live blogging so please step-up and keep them up2date! These posters starting emerging throughout the conference. I am not sure who was creating them, but they were outstanding. I'm secretly hoping it was our high school student volunteers.